Тhis course will help to prepare you for the Microsoft 70-345 exam. By the end of this course, you'll be on your way to being ready for your Exchange 2016 certification exam. 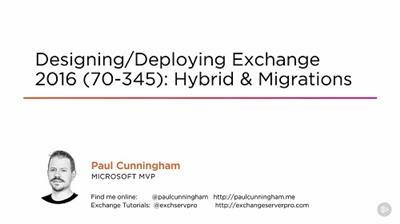 This course, Designing/Deploying Exchange 2016 (70-345): Hybrid & Migrations, will teach you about Exchange Federation, coexistence with Office 365, and migrating to Exchange 2016 from earlier versions of Exchange. First, you'll learn about using federation trust, organization relationships, and sharing policies to provide sharing of calendars and free/busy information between different Exchange organizations.